Advantages: General arrangement drawings in both 1/72 and 1/48 scales, excellent selection of “walk-around” photographs, superb artwork. The latest addition to MMP’s “Orange” series is the story of the Fiat CR.42. This book is presented in 144 pages in a size that is slightly larger than A5 and a lot of information is contained within the soft card covers. The first chapter revolves around the aircraft’s development history. Here we see the different variants explained which are also backed up with scale drawings. These are done in 1/72 but a “lift-out” provides the modeller with equivalents in the larger 1/48 scale. The “Falco” started with the Regia Aeronautica and this heads a section that describes the biplane’s service with a number of different users. Apart from Italy, we see the Belgian, Swedish and Hungarian air forces also discussed, along with a couple of pages allowing for Allied and Luftwaffe use. One of the highlights of the book is the “walk around”. A number of preserved examples from Sweden, Italy and the UK are used for this photographic feast. There are plenty of close-ups from all aspects of the CR.42, including the obligatory detailed shots of the cockpit and engine. Punctuated amongst these are reproductions from the aircraft’s spare parts manual. This gives the reader an excellent opportunity to get a better understanding of the subject. The aforementioned artwork encompasses 32 aircraft with many having added views to further enlighten the reader. These are done by Artur Juszczak and his work is superb. He illustrates the main colours and markings worn by all users of this biplane, including a captured example found in Allied hands. 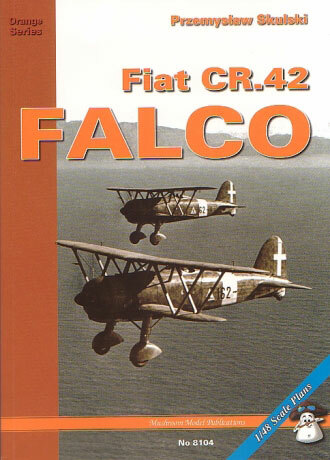 This book is a great “one stop shop” for information on the CR.42. With over 115 close-up images and another 13 from the workshop manual, modellers should have no trouble adding extra detail to their kit. The colour profiles should inspire the builder to try one of the more complicated camouflage schemes and add a touch of the unusual to their collection.